This is a story about bravery and love. 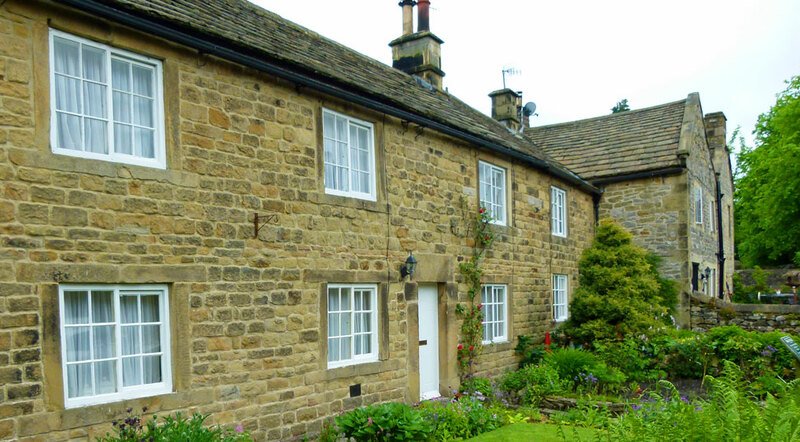 It covers just one chapter in the long history of the village of Eyam (pronounced ‘Eeem’ *), tucked away in Derbyshire’s Peak District just north of Bakewell. Casual travellers between Chesterfield and Chapel-en-le-Frith would pass it by without comment – unless they knew: in that case, they might say, “Ah, there’s Eyam”, in a respectful kind of tone. Man has been in the neighbourhood since at least the Bronze Age. The Romans were interested in the local lead mining industry which, by the 18th century, had made Eyam a relatively prosperous place. The village was an Anglo-Saxon settlement; it was recorded as Aiune in the Domesday Book of 1086, which means something like ‘the pieces of land between streams’. 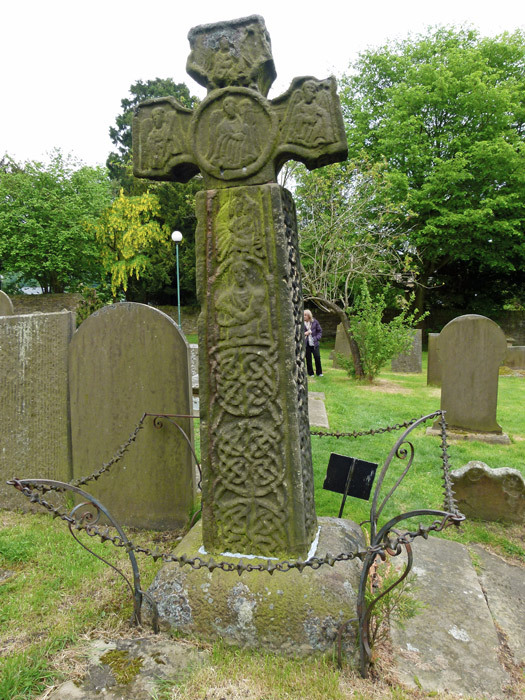 In the churchyard of the 12th century church of St Lawrence is an 8th century Anglian stone cross – probably a preaching cross originally situated elsewhere, which provided the focal point for local worship long before the church was built. 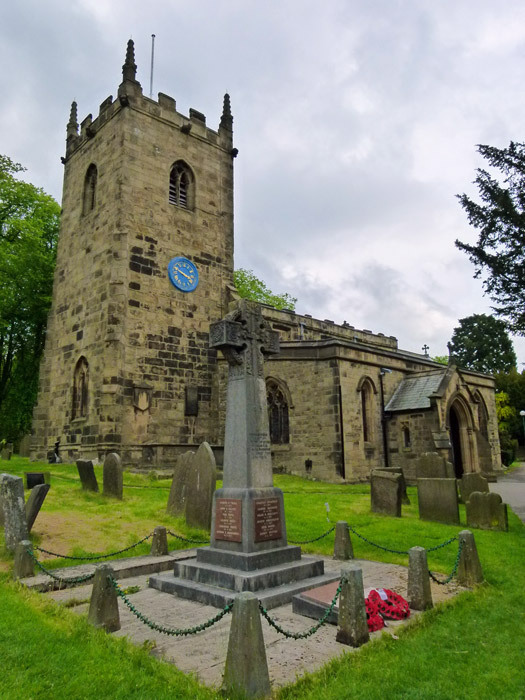 In any event, Eyam has been continually occupied for more than thirteen hundred years and has much to recommend it, not least the surrounding countryside (where there are many fine walks), its medieval church and Eyam Hall, built in 1676. Yet Eyam is chiefly, and unfortunately, known as Eyam, the Plague Village. In Britain, ‘the plague’ is a term which usually refers to what people understand to be the bubonic plague, Black Death, or Great Pestilence. It is a disease that primarily affects the black, or ship, rat, Rattus rattus via infected fleas. Having taken in the bacteria Yersinia Pestis when biting an infected rat, the flea finds it is unable to ingest and, starving, embarks on a feeding spree, attempting to satiate its hunger. It will feed on any convenient victim – another rat, a human or other mammal, vomiting blood containing the bacteria as it does so, in an attempt to clear its blocked stomach, and passing on Yersinia Pestis in the process. Bubonic plague results from an infection of the lymph nodes, causing painful suppurating bloody-black sores – particularly in the armpits and groin area. Other symptoms include severe pain, fever and gangrene in the extremities (ie toes, fingers, nose). In fact, there are two other possible developments. Septicaemic plague is caused when the infection spreads through the body: it ultimately inhibits blood coagulation and is usually fatal because sufferers more or less bleed to death internally. The third form of plague is pneumonic, which is highly aggressive, contagious and almost always fatal. Settling in the lungs, the bacteria cause them to liquefy. Pneumonic plague does not need the assistance of rodents or fleas to spread; it is caught by direct and indirect contact as well as via droplets coughed or sneezed by its dying victims. Some people must be immune, but for most of us anything closer than 12 feet can be deadly. The plague first arrived in Europe in the 14th century, when it killed an estimated 25 million people, about 2 million of them in Britain (see When death walked the land). There were many outbreaks after that; we do not have records of them all and will never know the name of every community that simply disappeared as a result. In 1665, not for the first time, the plague visited London. On that occasion it killed an estimated 100,000 people (20% of the population). Further outbreaks occurred throughout the country that year; most of them long forgotten now. The pestilence came to Eyam, so the story goes, in the innocent shape of a box of cloth from London. It arrived that warm summer of 1665, in late August or early September, and was delivered to the house of Mary Cooper, a widow who had recently remarried one Alexander Hadfield, tailor. The contents of the box were damp and, consequently, were laid out to dry by a servant (or tailor’s assistant), George Viccars. The suggestion is that infected fleas, or their eggs, had found their way into the folds of the cloth. Viccars probably never knew what killed him; he fell ill, was dead just days later and was buried on 7th September. 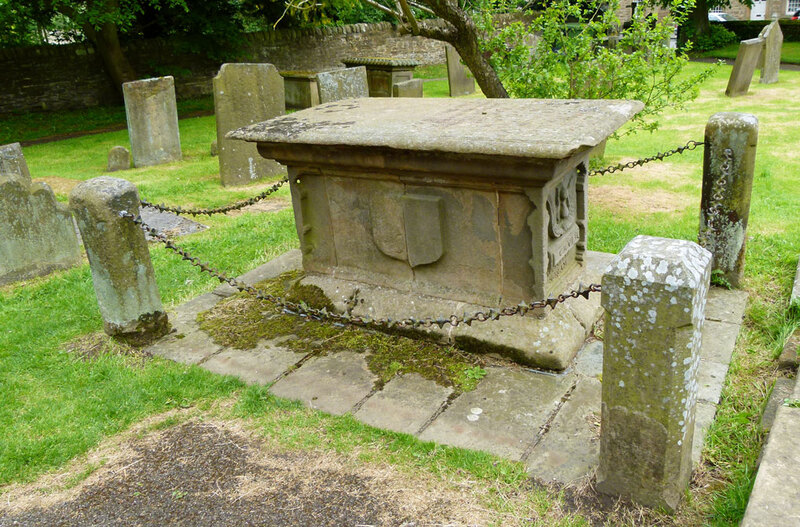 They buried young Edward Cooper, Mary’s 4-year old son, on 22nd September. On 23rd, they buried a neighbour, Peter Hawkesworth, and on 26th another neighbour, Thomas Thorpe. On 30th they buried Thorpe’s daughter, Mary, as well as Sarah Syddall from across the road, both aged 12. Six people living in close proximity dead in under a month. Word would have spread. They must have realised what it was. Terrified, the villagers were largely helpless. Medical knowledge was primitive and treatments ranged from useless poultices to ridiculous and repugnant remedies. 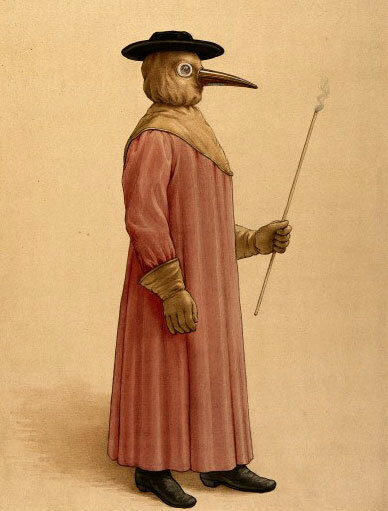 Some people believed that disease was spread by a miasma, a poisonous malodorous vapour; pomanders stuffed with sweet-smelling herbs and spices were carried, pipes smoked, or braziers burnt to clear the air. They simply did not understand what they were dealing with. Some, inevitably, looked for fanciful, superstitious, explanations. To many, it was clear that the wrath of God was being visited upon sinners. There was nothing that could be done in the face of a Divine punishment; it simply had to be endured. Others, particularly the more affluent, left the village. But this was not an option most could seriously consider: they could not just abandon their livelihoods and, in any event, had nowhere to go; they would certainly not be welcomed in other communities, who might even kill suspected plague carriers. A few villagers packed what they could and made some kind of home in the hills. There were 23 more deaths that sad October. They included 5 more Syddalls, 4 more Thorpes, 5 Torres and 4 Banes – the entire family, except for a young baby. On 28th October, Mary Cooper’s oldest son, Jonathan, was buried. Records suggest that plague deaths slowed down over winter – the disease is happier when it’s warm. Still, 33 died over the next six months. This brought total deaths to 62, in addition to those known to have passed on from other, or natural, causes. Just two died in May. But if the scared folk of Eyam thought their tragedy was easing, they were wrong; things suddenly got a whole lot worse in June. What to do? The obvious community leaders – the wealthy – had left. The young parson, however, William Mompesson, had decided to remain with his parishioners and his wife, Catherine, stayed with him. Also in the village was a previous rector, a staunchly Puritan and popular older man called Thomas Stanley. It is said that the two men had little in common but, recognising both the need for a common plan and the fact that each would command the loyalty of different religious factions, they came together to prepare a scheme to put to the villagers. We can imagine that some form of gathering took place, probably in the open air. We cannot imagine what was going through the heads of the fearful, defenceless, villagers who attended. But they did, and they agreed with what Mompesson proposed. Firstly, the dead would be buried quickly, by those close to them, and without ceremony to reduce the risk of infection spreading. Nor would loved ones be laid to rest in the churchyard; neither the parson nor the sexton could keep up with demand. Secondly, there would be no public gatherings; the church would be locked. Thirdly, the village would place itself in voluntary quarantine. It all makes sense, doesn’t it? But the consequences of these decisions were profound. To not be interred in consecrated ground meant that a soul might not get to paradise. Still, people went with it, burying their dead in gardens or on the hillside. Some of these graves can still be seen, but most have vanished without trace. Even if the church was shut, people needed to come together and the place chosen for this, a natural amphitheatre just outside the village called Cucklett Delph, is still used for an annual service on the last Sunday in August – Plague Sunday. Most telling, though, was the decision to cut Eyam off until the danger had passed. You could argue that the villagers had no choice – as we’ve already said, most had nowhere to go. But the fact is that remaining in the village dramatically increased the risk of catching the disease – and they knew that. Such a decision would be difficult enough to enforce today: 350 years ago, it would have been impossible; its success relied on everyone sticking to the agreement. We said this was a story about bravery and love; and there you have it. Whether religious or not, no one can argue with, “Greater love hath no man than this, that he lay down his life for his friends.” Or, in this case, neighbouring towns and villages. 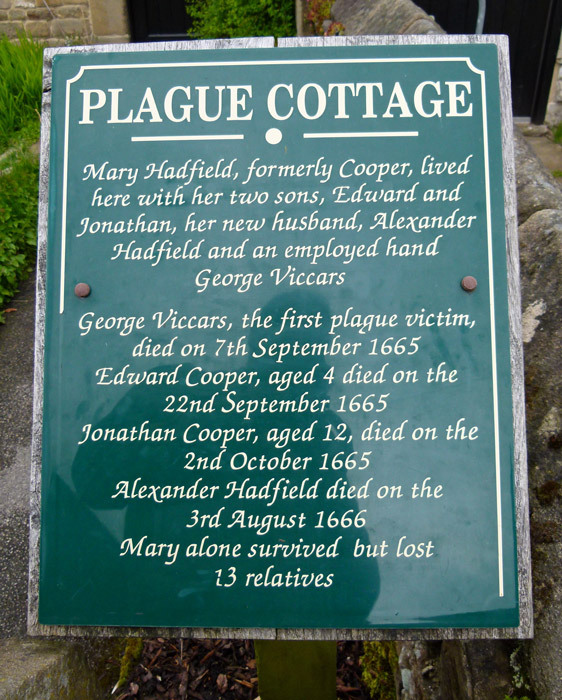 So the villagers stayed in Eyam – along with the plague. 21 died in June, 56 in July and a horrifying 78 in August. Eventually, the plague ran its course and the last victim fell in November 1666. There are no reliable population figures for 17th century England and therefore there is some debate about the statistics. It has been estimated that the population of Eyam in 1665 was in the region of 690. We can be reasonably certain that 260 of these died of the plague – which would make a death-rate of 37.68%. Even if the original population was higher – some have suggested a figure of around 800 – the death-rate is still well in excess of 30%. 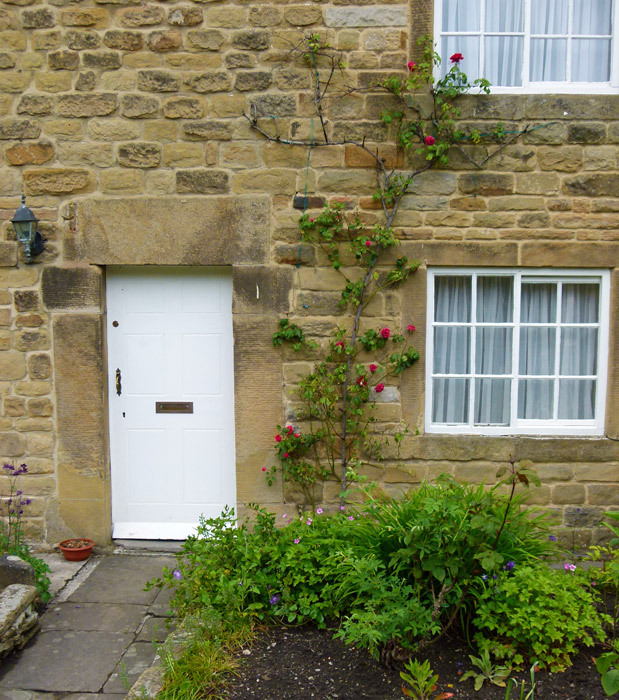 Practical arrangements had to be put in place to sustain Eyam during its isolation. Chatsworth House, seat of the Earl of Devonshire, is a few miles to the south. The Earl arranged for food and other supplies to be left at the village boundary at his own expense. Other supplies were left by suppliers from surrounding villages at what is now known as Mompesson’s Well and at other locations. Payment was left in running water at the well, thereby (it was hoped) washing away “the seeds of the plague” from the coins, or by placing coins in holes drilled in holes at the boundary stone and covering them with vinegar, which it was believed had a cleansing effect. Behind each start statistic, of course, is a human story. Catherine Mompesson is known to have assisted her husband and to have selflessly visited the sick and dying. One evening, walking home with her husband, she mentioned sensing a sweet smell in the air – by all accounts an early symptom of plague – and was dead within days. Special permission was granted for her to be buried in the churchyard and her tomb is the only known plague grave there. William Mompesson continued to pilot the village until the end; much later, he remarried and went on to have a distinguished career. Elizabeth Hancock personally buried six of her children and her husband within the same week; their graves can be seen today near Riley Wood. Elizabeth survived. 22-year old Emmott Syddall and Rowland Torre, from nearby Stoney Middleton, were head-over-heels in love. He would visit her daily and they planned to marry. When the plague came, they used to meet outside the village, at a distance, so that he could be sure she was well. One day, she didn’t make it. Plague is still with us – and we have had new horrors to deal with, like Ebola. But Eyam was the last serious outbreak of plague in England and it gradually disappeared from Europe as a whole. Probably, the improvement of living conditions, such as better sanitary arrangements and building materials that did not encourage rats, were contributory factors. 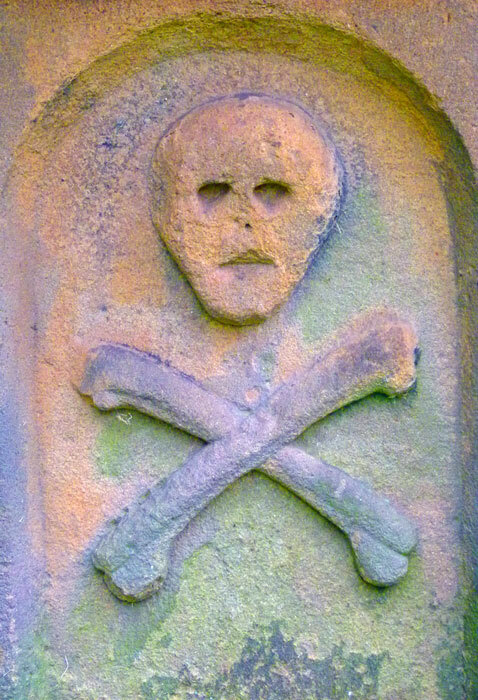 There are some, incidentally, who argue that Eyam’s curse wasn’t plague, but typhus, anthrax – or even measles. In any event, Eyam survived and prospered, but has never forgotten. It is, of course, far more than a plague village – and these days you’re more likely to catch a cold from the hoards of schoolchildren that visit. But I got the feeling, walking round, that this is a tremendously strong community. The evidence that people work hard on it is all about. The church is worth a visit in its own right, with some astonishing 16th century wall paintings, a Saxon font and other features. 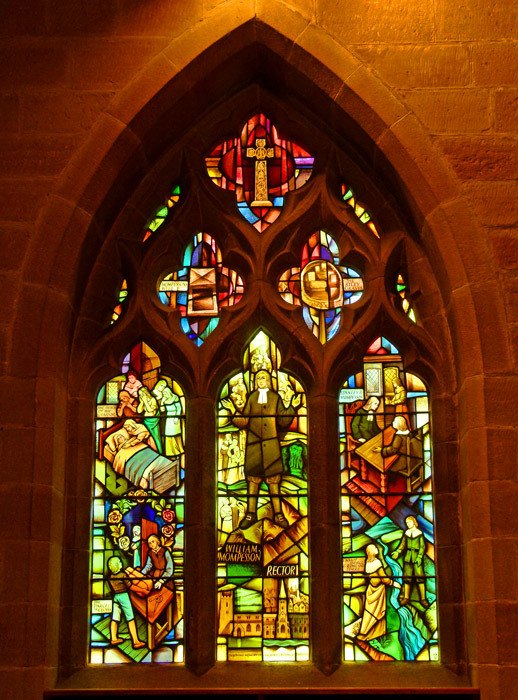 It inevitably includes ‘plague material’, including a modern stained glass ‘Plague Window’ and a record of plague deaths. Plaques outside cottages – private homes, not museums – tell of the people that lived and died there. I have made a note to visit at the end of August sometime, during the village’s Wakes Week, which includes a sheep roast, well dressing and, yes, the annual Plague Commemoration. 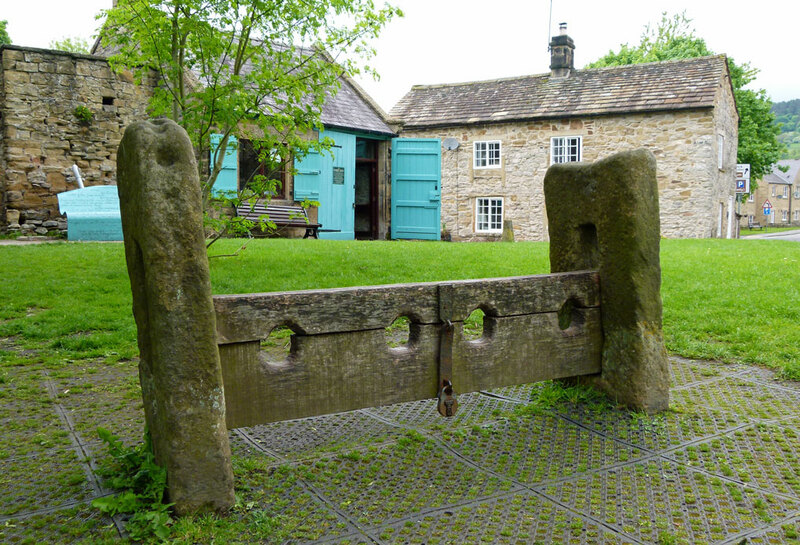 For more information, visit the website of Eyam Museum, which includes a wealth of information on the village and area. * By way of an update on the pronunciation, I met a woman, born not far from Eyam, who insists it should be said “EE-yim”. Anyone from Eyam want to settle this one? 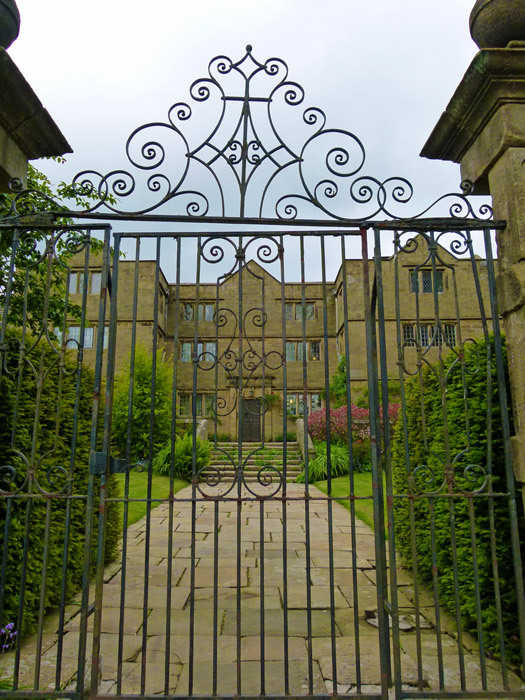 Go to A Bit About Britain’s directory listing for Eyam, and discover other places to visit. Well I am a Derbyshire lass and the women is correct. Thanks, Rosemary! I hope to resume normal commenting later this month – sorry I’ve been a bit absent!